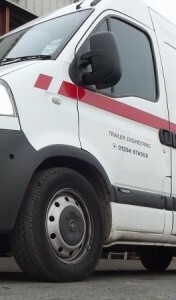 We offer all types of test, servicing and repair for Felixstowe.RTJ Trailers We offer all types of test, servicing and repair for Felixstowe. Sometimes you cannot get to us so in these cases we offer a 24 hour nationwide breakdown service for trailers using our own fleet of fully equipped vans based throughout East Anglia, Tilbury and Southampton and a carefully chosen network of suppliers nationwide. At RTJ we know the importance of having your vehicles on the road and offer on site trailer servicing and repairs, saving you both time and money. We offer all types of servicing and repairs. All our work is carried out to latest VOSA requirements and beyond and our administration back up means you will have all the necessary tools to comply with the maintenance requirements of your Operators License. Whatever the size of your fleet, we can provide your trailer maintenance.